San Ramon apartments are in a perfect location for those looking to commute anywhere in the Bay Area. Located just off the I-680 and halfway between San Jose and San Francisco, they are less then 40 miles to either city. As part of the Silicon Valley, San Ramon offers many employment opportunities of its own. Corporations like Chevron, 24 Hour Fitness and AT&T have headquarters at the Bishop Ranch corporate parks. 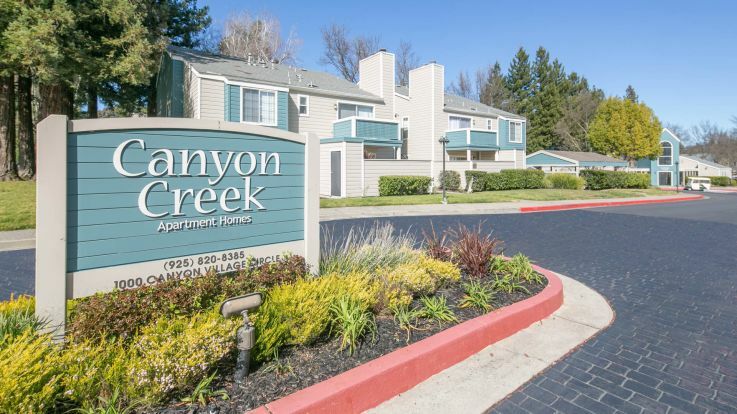 Our San Ramon apartments are close to shops and services, including dry cleaners and pet car. The Diablo Canyon Shopping Center and Crow Canyon Commons are right down the street. There are great restaurants in the area, as well as clubs and cinemas. If you are a golfer you can take advantage of Crow Canyon Country Club, Bridges Golf Course, Canyon Lakes Golf Course and others. The San Ramon Valley Unified School District boasts great schools like San Ramon School, Twin Creeks Elementary, Montessori, California High and Dougherty High. The University of San Francisco, Diablo Valley College and UC Davis Graduate School of Management also have campuses in the area. You can also take advantage of the area’s recreational parks and libraries. Our beautiful San Ramon apartments have all been newly renovated to include gorgeous new cabinets, wall-to-wall carpeting, private balconies with views of Mt. Diablo, fireplaces, and walk-in closets. Kitchens have top-of-the-line kitchen appliances. Amenities include heated swimming pool, hot tub, carport, courtesy officer and laundry facilities. Furnished and corporate apartments are also available. Equity’s San Ramon apartments offer quality living in Easy Bay North. If they don't fit all of your needs, please take a look at our other luxury properties in the Bay area.